→How Often Should I Change My Air Compressor’s Oil? Changing the air compressor’s oil is one of the most important tasks when maintaining your oil compressor’s performance. Anything that runs on a motor engine needs oil, which, over time, decreases in quality and viscosity. Unfortunately, many users of air compressors fail to take note of such a task, only noticing when their machines malfunction. How Important is Changing the Oil? Oil plays a vital role in your air compressor’s functions. It ensures that the machine’s components do not break apart after hours and hours of use. Without the lubricating properties of oil, the compressor’s mechanical components will decay at an accelerated rate until they jam or literally break apart. However, the oil itself is also susceptible to the same wear-and-tear that affects the air compressor’s multiple components. It loses its viscosity over time, which means that it thickens and can no longer distribute itself evenly across the air compressor’s components. Naturally, damage to the air compressor follows, prematurely ending the machine’s life. As such, you’ll have to routinely change the oil to extend your air compressor’s lifespan. So, the question is, how often should you do that? The most obvious answer is—it depends on what type of air compressor you use. If you’re using a rotary screw compressor, it will be necessary to change the oil when you reach a certain number of usage hours. This type of compressor is highly efficient in utilizing the compressor oil, so you don’t have to change it very often. 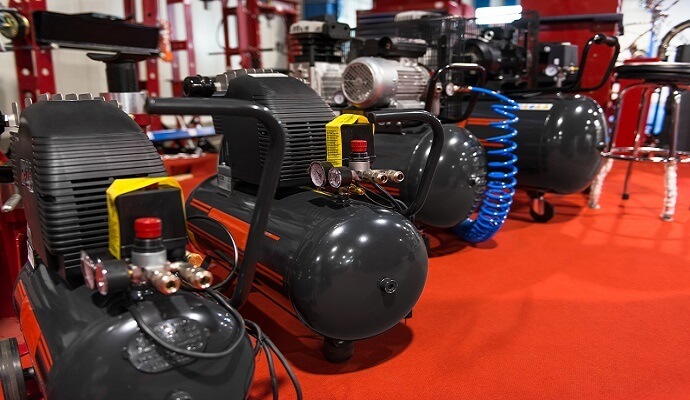 You’d just have to track the hours of usage logged by your air compressor—when it reaches 7000 to 8000 hours, that’s the time for you to start shopping for new compressor oil. The reciprocating air compressor is a different story entirely. It requires more frequent changes of oil, as you’d have to do the task every 3 months. The best thing to do when you’re confused about the frequency of changing compressor oil is to contact the machine’s manufacturer and ask the ideal changing intervals for your particular model. This information should also be available in user manuals that come with your purchase of an air compressor. If you have a local machine shop or body shop, you can also ask them for advice on how and when to change the air compressor oil. Be sure to ask about other pointers for maintenance and cleaning. Regular changing of your air compressor’s not only extends its lifespan, it also ensures that your compressor is completely safe to use. You may have opened your compressor, for instance, and drained the oil but forgot to replace it. It’s almost unthinkable, but still possible, no matter how remote. In any case, operating an air compressor without or with very little oil can seriously damage the machine. There is also the possibility of the components literally exploding and spraying fragments all over the place. That is basically the gist of it. To check the machine’s oil levels, simply use a dipstick, which you can submerge into the fuel tank. You can determine the depth of the available oil using the graduations in the oil stick. If there is very little oil left, drain what’s left and replace it with a new batch. If you own a car, an air compressor pretty much requires the same kind of maintenance to the machine’s motor, so this shouldn’t be new to you. Don’t forget to read up on safety issues outside of insufficient oil that you have to be aware of when you own an air compressor.